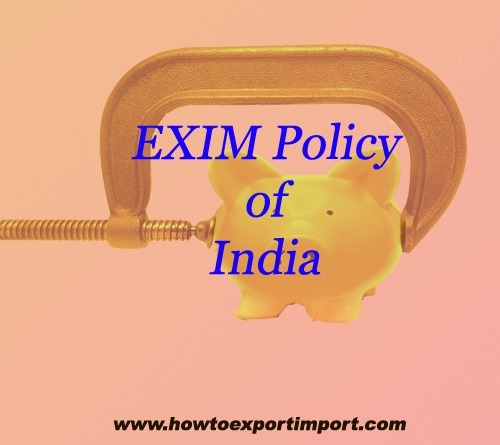 This post explains about the procedures and formalities to apply for MEIS, Merchandise Exports from India Scheme under Foreign Trade Policy of India 2015-20. These details about filing of application and other process to claim MEIS helps exporters of India for claiming MEIS scheme from government of India. An application for claiming rewards under MEIS on exports(other than Export of goods through courier or foreign post offices using e-Commerce), shall be filed online, using digital signature, on DGFT website at http://dgft.gov.in with RA concerned in ANF 3A. The relevant shipping bills and e BRC shall be linked with the on line application. If application is filed for exports made through EDI ports, then hard copy of the following documents need not be submitted to RA: hard copy of applications to DGFT, EDI shipping bills, electronic Bank Realization Certificate (e-BRC) and RCMC. The applicant shall submit the proof of landing in the manner prescribed under paragraph 3.03 of Hand book of procedures of Foreign Trade Policy 2015-20. In case application is filed for exports made through non EDI ports, then applicant need to submit export promotion copy of non EDI shipping bills. The applicant shall submit the proof of landing in the manner prescribed under paragraph 3.03 of HBP. The applicant shall upload scanned copies of any other prescribed documents for claiming scrip unless specified otherwise. However applicant need not submit hard copy of applications to DGFT, electronic Bank Realization Certificate (e-BRC) and RCMC in this case also. Applicant shall file separate application for each port of export. Processing of Non EDI Shipping bills at RA: In cases the Non EDI shipping bills or the shipping bills not received through the Message Exchange from Customs, concerned RA shall verify the details entered by the exporter from the original shipping bills before grant of scrip. No manual feeding allowed for EDI shipments: For EDI Shipping Bill, no manual feeding of shipping bill details shall be allowed to the applicants in the online system. Rewards will be granted by RAs without the need for cross verifying EDI Shipping Bill details. RA shall process the electronically acknowledged files and scrip shall be issued after due scrutiny of electronic documents. The documents which are not required to be submitted in original shall be retained by the applicant for a period of 3 years from the date of issuance of scrip. Licensing Authority may call such documents in original at any time within 3 years. In case the applicant fails to submit the original documents on demand by Licensing Authority the applicant shall be liable to refund the rewards granted along with interest at the rate prescribed under Section 28 AA of Customs Act 1962, from the date of issuance of scrip. Eligibility of product, corresponding ITC [HS] code, and markets (as given in Appendix 3B) for claiming rewards under MEIS under Foreign Trade Policy 2015-2020 (FTP 2015-20) shall be determined from Let Export Date as per Paragraph 9.12 of HBP. The above post explains about the guidelines to apply for MEIS claim from government of India for exporters of India. If you would like to have more information to share about this post, How to apply for MEIS under Foreign Trade Policy 2015-2020, write below. Comment below your thoughts about guidelines to apply for MEIS claim. Md. Sakeeb Qayam: On 03 June 2015 Thank You!! PADAYATTIL VARGHESE JOSEPH : On 17 October 2015 PNEUMATIC OPERATION MECHANICAL MACHINERY IS EXPORTED TO INDONESIA ON 02.10.205,CLAIMED FOR DRAWBACK BUT UNAWARE OF THE MEIS SCHEME.NOW HOW I APPLY FOR MEIS BENEFIT .PLEASE DIRECT US . Manoj Kakaria: On 15 December 2015 Do we need to get ourself compulsorily registered with export promotion councils to get the benifit of MEIS? Jyoti Rathod: On 04 March 2016 In case EDI port SBs if Hard copy of said documents are not to be submitted then what is to be submitted manually ? only online application is enough ? How to get the SCRIP from Addl.DGFT ? Pls revert. J Kurien: On 23 March 2016 what is the full form of EDI ? Amin: On 15 July 2016 Do we need to get compulsory ourself registered with carpet per motion council to get the benefit MEIS ? Hans raj: On 16 July 2016 i want to start a business of export. i don't know from where i do search buyer related to my product..
Randhir Singh : On 10 August 2016 Can you please share the steps for export of Ebrc from Dgft website? Kavita Chavan : On 11 August 2016 I am from Pradman Engineering Services Pvt. Ltd. We are applying for SEIS Certificate for that I need some guidelines like how to apply, Documents & all etc. Amit Chorera : On 17 August 2016 I came across your website. It is very informative. Thanks for the same. I have one question which I hope you can advice. Chapter 10 is not present in schedule of rates of MEIS scheme. Does exporter continue to get the VKGUY benefit for products under chapter 10? our understanding was MEIS is merger of VKGUY , FMS and FPS, Is that correct? Please advise. SIVAMALAI: On 21 September 2016 RE. MEIS APPLICATION on line application: I AM IN THE PROCESS APPLYING MEIS APPLICATION. S.BILL ARE EDI & e-BRC. I have attached both of these documents from repository. Next, coming to main frame and getting e-com file# I selected licencing period. Reg. Uploading of docs: what are the documents to be uploaded? Is the same to self-attested? After submitting on line any hard copy of the docs to submitted toDGFT. Please advise. Jignesh V Banker: On 27 September 2016 MEIS APPLICATION on line application: I AM IN THE PROCESS APPLYING MEIS APPLICATION. S.BILL ARE EDI & e-BRC. I have attached both of these documents from repository. Next, coming to main frame and getting e-com file# I selected licencing period. Reg. Uploading of docs: what are the documents to be uploaded? Is the same to self-attested? After submitting on line any hard copy of the docs to submitted toDGFT. Please advise. Saksham: On 21 October 2016 As the time limit to apply for MEIS is 1 year, but can we apply after one year or can we apply for condonation. If yes than what is the procedure and its effects? Meghana Shelke: On 15 December 2016 Please send me the detailed information related to application of MEIS scheme and its procedure. Junaid: On 25 January 2017 Can you guide me with MEIS online filing procedure. We are not aware of it at the moment and need to understand how the process is done. Dinesh Rathore: On 25 February 2017 Dear Respected Sir, Can you guide me with MEIS online filing procedure. We are not aware of it at the moment and need to understand how the process is done. Jinessh: On 25 March 2017 How would I get File No. and Key No for application of MEIS? Please note I already submitted application through Digital Sign. MJ: On 31 March 2017 Does the application (to receive benefits under MEIS) cost Rs.1000? Vishanta: On 20 July 2017 When to file application under MEIS? What is the time period? Do we need to file yearly application? Please tell me. Neha: On 02 August 2017 Hi, Vishantha - You can file Meis anytime within three year of export date. Francis- steps are given over dgft website. kindly refer Naveen- directly log in with Digital signature. no need for entering IEC or Branch code. sivaramakrishnan: On 18 June 2018 Hello Sir, currently i have work in MEIS project. while i clicking the export item box that will come blank page. i unable to open the product details page. Also, can you please step by step procedure send to my email id with scrren shots. i dont know how will claim this scheme. i have only shipping bill data provided from my company. please guide me to continue work in the project. Mousumi : On 02 July 2018 After uploading the full process for MEIS claim documents to DGFT Website, how many days it requirs to get the claim scrip from the Department? Abhay: On 15 October 2018 Can you please share the steps for export of Ebrc from Dgft website? And what are the documents to be uploaded? And pl let me know What are the documents/papers in Original or duplicate (copy) are required to be submitted in dgft. Rohit Khaitan: On 28 November 2018 Hello, I am a consultant for DGFT related liaison work. In case any of you are having difficulty regarding the applications for MEIS or any other schemes (DFIA, Advanced Authorisation, EPCG issuance/ redemption, etc.) please connect with me at rohit@minuinternational.com or call/ whatsapp 9920996486 . We, at Minu International are experts in the field since 35 years.